What does Information Management “Modernization” Really Mean? Organizations are seeking “something” to be different in how they manage the information assets that are, after all, the future of their business. After two decades of implementing content management products and a lot of customization bucks, organizations find themselves with, frankly, an information management mess. Mission critical document-intensive process problems were indeed solved along the way, and that in itself was a major accomplishment. But those problems tended to be solved one at a time, product by product, department by department in the hopes that all of the information silos that were created would somehow migrate into a single magical archive or that one single product would somehow manage to someday “federate” everything else. And as cloud, mobile, and consumer technologies swept through organizations and the demand for content capabilities spread to everyday knowledge workers, the magnitude of the problem became exponentially more challenging. But why is information management modernization particularly important right now? What does modernization really mean? 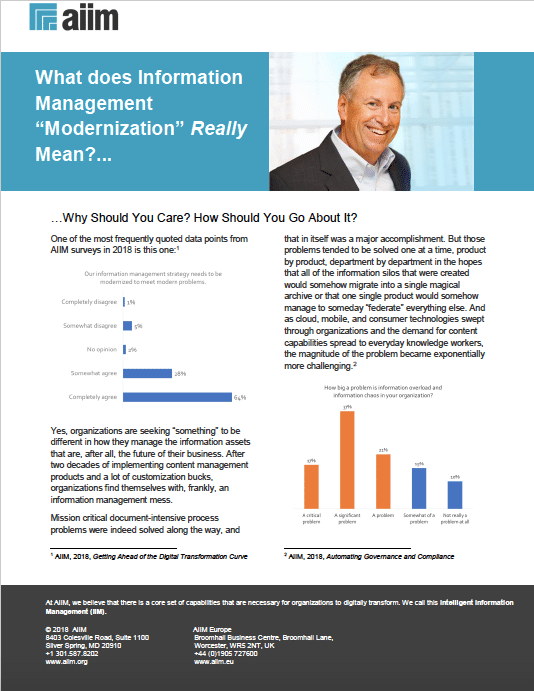 How should you approach modernization? Find out with this FREE tip sheet.